2016 has been a very good year for all of us here at The Conscious Cat. Our readership and fan base continued to grow, thanks to all of you who read this blog every day, comment here and on our Facebook page, and share what you read with your friends and followers. Allegra, Ruby and I appreciate your support more than words can say. With close to 400 posts, it’s hard to highlight only a handful of posts. Today, I’m featuring the year’s 5 most popular posts in the Feline Health category. Frequently, the first advice guardians of a cat who was just diagnosed with kidney disease hear from the veterinarian is that the cat should eat a restricted protein “prescription diet”. However, there is more to feeding a cat with compromised kidney function than simply restricting protein. Feline veterinarian Dr. Elizabeth Colleran wrote about the dire consequences of making poor dietary choices for these cats. Click here to read the full article. A dirty litter box, to a cat, is the same as a public restroom with unflushed toilets and toilet paper all over the floor is to us. How many times have you walked out of a restroom like that without using it, no matter how badly you needed to go? Keeping a clean litter box is one of the responsibilities of being a good cat parent. Click here to read the full article. There is no question that vaccines protect against disease, but they also present considerable risk. 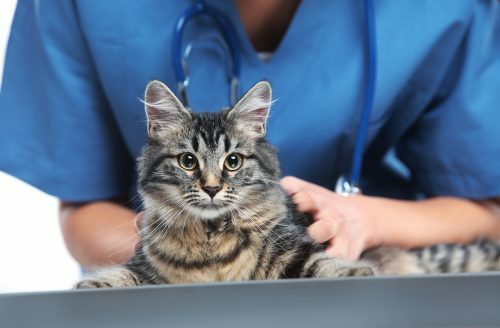 Far too many cats are still being over-vaccinated because too many cat parents still think annual “shots” are necessary, and sadly, far too many veterinarians still recommend them. This is a complex issue, and it’s up to cat guardians to educate themselves so they can make the best decision for their feline family members. Click here to read the full article. Leonardo DaVinci’s quote “The smallest feline is a masterpiece” is never more true than when it comes to feline anatomy. In addition to being wonderful creatures in so many ways, cats also have some unique anatomical abilities that they share with no other species. Click here to read the full article. Is Chemotherapy the Right Choice For Your Cat? Finding out that a beloved cat has cancer is heartbreaking for cat parents. The sad reality is that cancer is one of the leading causes of death in older cats. However, a cancer diagnosis does not have to be the end of the road. In fact, just like with humans, treatment is often possible, and chemotherapy may be one option that can allow your cat to live comfortably for many months and even years. Click here to read the full article. We’re looking forward to bringing you all the information you need to keep your feline family members happy and healthy in the coming year and beyond. The post 2016 in Review: Our 5 Most Popular Feline Health Posts appeared first on The Conscious Cat.